Assisting 13708351 developers since 2005. Today Priscilla and I purchased a Canon EOS 30D Digital SLR Camera as an early Christmas present. What made things great is 0% interest for 18 months on our Best Buy card, plus we recieved 10% off the accessories. Image Size: ~24MB at max. res. File Size: ~3.6MB at max. res. Well anyways, I plan on using this camera to take pictures of family, friends, and architecture around San Antonio. David, congrats on the purchase. I've had my eye on the Digital SLR's for quite some time and I like Canon's the best. I've been looking at the Digital Rebel 350D, not as high end as yours, but I really do like what Canon is doing with DSLR's. I've been thinking of putting my Minolta Maxxum 35mm SLR and telephoto lens up on eBay or something since I use my point-and shoot digital a lot more now and I could put that cash towards a DSLR. I also like the Lowepro bags. I bought a small one for my Canon Powershot. I'll definitley be keeping an eye on your flickr page more to see some more of your photos. Michael I woiuld recommend that you act now since all these rebates are out, and no interest payments. Seriously this camera is beyond sweet...in the tulip picture I took above, in the full res. you can see pollen on the flowers pistil & stigma. 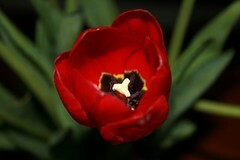 I'd love to see the full-res tulip photo if you can send it to me through dropload or yousendit sometime. Have fun and looking forward to seeing your pics. Awesome man, I just installed lightroom not bad to view images. Picassa had an nice interface, but was rather hard to navigate.